When an Outlook app is installed on your computer, you can use it to move email, contacts, and calendar items from one email account to another.For example, let’s say you have an Office 365 mailbox and a Gmail account. You can add both of them to Outlook. Then, you can use Outlook to export items from your Gmail account and import them to your Office 365 mailbox.You export items by creating a .pst file, which is an Outlook Data File that contains your messages and other Outlook items and is saved on your computer. 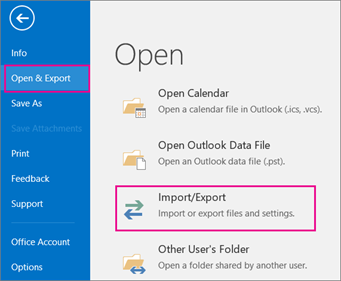 To learn how to import items after you export them, see Import email, contacts, and calendar from an Outlook .pst file. Add your “source” email account to Outlook. For example, you might add your Gmail account to Outlook 2016. Wait a bit for all of your email and contacts to show up. Add your Office 365 email account to Outlook. After you do this, Outlook will automatically sync with Office 365. You’ll see the contents of your Office 365 mailbox appear in Outlook. 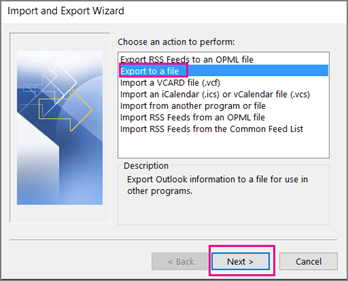 Choose from the export instructions to export your email from your source account to a .pst file.For example, if you have Outlook 2010, choose “Outlook 2010: Export Outlook items to a .pst file”. At the top of your Outlook ribbon, choose File.If your ribbon doesn’t have a File option in the top left corner, see What version of Outlook do I have? to determine your version of Outlook and to get to the right export instructions. Select the name of the email account to export, as shown in the picture below. Only information for one account can be exported information at a time.Make sure that the Include subfolders check box is selected. This way everything in the account will be exported: Calendar, Contacts, and Inbox. Choose Next. Note: If you’ve used export before, the previous folder location and file name appear. Type a different file name before clicking OK.
Now that your Outlook data is in a .pst file, it’s portable. For example, you can save the .pst file to OneDrive, and then download it to your new computer. Or you can save it to a usb flash drive, plug the drive into your new computer, and then Import email, contacts, and calendar from an Outlook .pst file. At the top of your Outlook ribbon, choose the File tab.If your ribbon doesn’t have a File option in the top left corner, see What version of Outlook do I have? to determine your version of Outlook and to get to the right export instructions. In Outlook 2007, at the top of your ribbon choose File.If your ribbon doesn’t have a File option in the top left corner, see What version of Outlook do I have? to determine your version of Outlook and to get to the right export instructions. Select Export to a file, and then click Next. Click Personal File Folder (.pst), and then click Next. If you want to password protect your .pst file: enter the password in the Password and Verify Password boxes, and then click OK. In the Outlook Data File Password dialog box, enter the password, and then click OK. 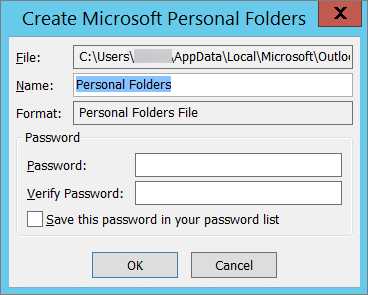 If you are exporting to an existing Personal File Folder (.pst) that is password protected, in the Outlook Data File Password dialog box, enter the password, and then click OK. When Outlook exports email, contacts, and calendar info to a .pst, it makes a copy of the information. Nothing leaves Outlook. You’ll still see and have access to your email, contacts, and calendar in Outlook. 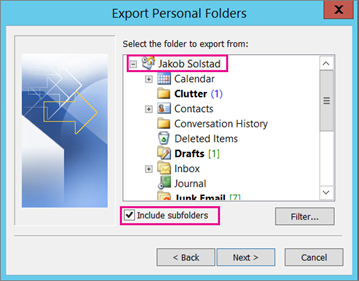 Outlook does not export meta-data such as folder properties (views, permissions, and AutoArchive settings); message rules; and blocked senders lists. 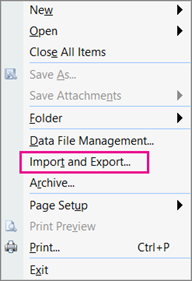 Important: If you’re using Cached Exchange Mode, Outlook will only export the items in your current cache. By default, your cache contains items from the past 12 months. To export more than the past 12 months of data, turn off Cached Exchange Mode first. For more information, see Turn Cached Exchange Mode on or off. You want to move email from one email account to another email account.For example, let’s say you have an old Yahoo email account, jakobsol77@yahoo.com. And you want to move your email to a new Office 365 email account, jakobsol78@contoso.com.Using Outlook on your desktop, you can add both accounts to Outlook. Wait a while for all of your email to show up (if you have a lot, this can be a long time). Then, use Outlook to export the email from your Yahoo account to a .pst file. Finally, import the .pst file to your Office 365 account. You’re moving from PC to PC: You’re moving your email from one computer with Outlook on it to another computer with Outlook on it.For example, let’s say your old computer has Outlook 2007 and you just got a new computer with Outlook 2016. Export your email data from Outlook 2007 (described in this article) and import it to Outlook 2016. You’re moving from PC to Mac: For example, when you’re moving your email from Outlook on a PC and importing to Outlook 2016 on a Mac. You want periodic backups: When you want to periodically backup all of your email, contacts, and calendar to a safe place. After you create the .pst file, copy it to a safe location, such as a USB flash drive, another hard drive, or cloud storage such as OneDrive or Dropbox.There’s no automated way periodically backup everything (old and new). Auto-archive only backs up old items, and it moves them rather than making a copy. If you only want to backup your contacts, see Export contacts from Outlook. It explains how to copy your contacts to a .csv file.